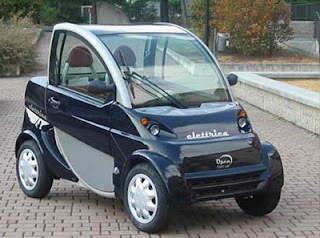 A new EV - but has it missed the boat? Where to start? Looks? On the challenging side. The Elettrica somewhat resembles a barber’s chair crossed with a greenhouse. Its very upright stance suggests that windcheating was not high among the design goals. Looking quirky clearly was. Price? On the high side. Make that very high. Its £12,750 price tag would happily buy a new Mini. And perhaps be better spent on one. Safety? The story starts to make some sort of sense. The thing has been designed with a strong safety cell and has been tested to standards beyond the overripe-tomato strength required of quadricycles. Makers rightly need to go beyond the law. Even if the makers of the infamously destructible G-Wiz insist that quadricycle resilience is good enough, most people will attach a higher value to retaining their legs after a 30mph impact. Technology? Again, a bit of a tick here. Apparently the body hails from Italy, and the electrics from the UK. This is the preferable way around. The batteries are Lithium Cobalt, as used in aircraft apparently, making for lighter weight, better charging profiles and superior energy densities when compared with bad old lead-acid lumps. They also last up to five years, allegedly. Distributors quote speeds of “up to 45mph” and “up to 70 miles” on a five-hour charge, but no doubt these figures require careful driving on downhill roads. Interesting stuff all told, but there is a big question mark hanging over this car. And over the G-Wiz, Th!nk, Mega City, Maranello4, and every other chassis with a battery. Almost all of the electric noddy cars currently prowling London’s thoroughfares are there because of the Congestion Charge, and that’s about to change. As early as 4 February 2008, any ordinary petrol or diesel car emitting less than 120g/km could slip into the C-Zone free of charge. And plenty of cars that fall under that threshold look, drive, and feel - well - normal. Some even look a bit attractive. Most seat four without contortion. All crash without folding up like a deckchair. The question is, do the remaining benefits of an electric tiddler add up? Or are these innovative cars just too crude to make sense in the absence of an £8-a-day incentive scheme?